“One way I get inspiration is from looking through magazines and keeping pages or parts of pages to look at later over time. But the problem is those pages pile up, and pile all over the place. So I started a system of organizing those saved inspirational clippings into binders with 8.5" x 11" plastic sleeves that I can page through whenever I need a jolt. 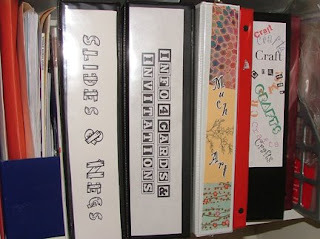 The binders are categorized into themes like art, craft, and how to. I also collect postcards, old photos, and random other scraps of found paper into these binders so the sleeves help keep them neat and uniformed." "I took all the bins and books out of these shelves (photo on right) and replaced them with the wool fabric I am using these days." I’m definitely going to heed this advice. 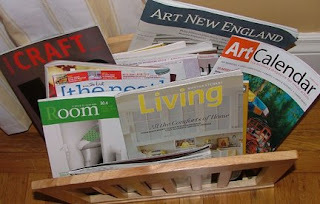 For further reading about cutting down on clutter and simplifying your life, check out the blog at unclutterer.com. 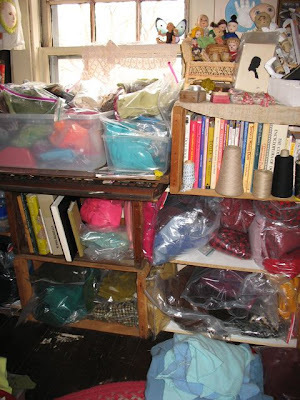 I recently discovered this site and am going to continue to check back for great organization tips!